The folks at the Knoxville Botanical Garden and Arboretum put together a touching and creative tribute to two special Knoxville women recently. During its popular annual Green Thumb Gala fundraiser, the garden unveiled a real “secret garden” created in honor of the late Andie Ray. Andie Ray pictured at the Knoxville Botanical Garden in 2014. It seems that Andie was a fan of the book, “The Secret Garden,” written by Frances Hodgson Burnett, an English writer who once lived and wrote in Knoxville. Andie’s parents, Rich and Jane Ray, provided the funds for the garden, which was designed by landscape architect Sara Hedstrom Pinnell. Andie passed away last year, cut down by cancer in middle age. For many years she owned the Market Square women’s store called Vagabondia, named after a book of the same name by Frances Hodgson Burnett. When Burnett lived in Knoxville, in the Maplehurst area, her own home was named Vagabondia Castle. Until this event at the botanical garden, I never realized the author of “The Secret Garden” lived in Knoxville for a time. The new garden is perfectly charming. Designed as a haven for children and adults, it provides a great view of the mountains and many areas for sitting and reading or quietly talking. It has sweet whimsical elements, as well, as you will see here. Christopher Ford and his daughter, Presley, approach the Secret Garden. Fall flowers at the entrance provided a welcome. Here’s one of the lovely sitting areas. From left, Kenneth and Jane Creed with Joan and Neal Allen check out the big nest. Cindy Hassil, left, and Jill Sublett taking advantage of a sitting area in the Secret Garden. You will see lots of animals in the Secret Garden. Andie loved animals, and they figured prominently in the book of the same name. Haha! This was a riot! That’s Doug McKamey in a greatly oversized chair. Meanwhile, back at the main tent, there was a party going on. From left, Betsy Castleberry, Andrew Duncan, Pam Robertson and Alice Stuart provided beautiful music for a beautiful evening. Andie’s widower Noel Hudson, left, with friends Kelley Segars and John Craig. Craig Griffith, left, with Cathy and Mark Hill. Ralph Cianelli, left, with Mary Thom Adams and Rick Fox. Judy Loest and Greg Austin. Deanene Catani, left, with Alan Carmichael and Emily Campen. From left, Chris Sneed, Will Smith, Donald Thorne and Steven Smith. From left, Angelia and Hugh Nystrom, Ben and Sara Hedstrom Pinnell, and Kati and Jim Blalock. From left, Craig Griffith, Ashley Capps and Bob Whetsel. Russ Watkins, left, and Rick Fox. Presley Ford, left, and her mother Kari, were studying some auction items. The auction items at this event are charming. Like this adorable birdhouse. And this bear made by a chain saw artist. This cute stuffed red panda represented a tour of Zoo Knoxville being offered. Antoinette Fritz offers a little magic potion for getting the bid prices up. Cucumber tea sandwiches seemed a little British in a nod to Frances Hodgson Burnett. The brie and pear tartlets were delish. Earl Taylor and Vicki Williams-Baumgartner. From left, Linda Schmid, Liz Stowers, Mark Campen and Anna Ford. When it was time to sit down, we saw how adorable the centerpieces were. What can beat pimento cheese biscuits? Caterer was Bradford Catered Events. Chris Crouch and Robin Thomas were at the Moxley Carmichael table. As were our design director, Charley Sexton, and his wife, Linnie. Here’s Michael Higdon, left, with Moxley Carmichael V.P. Scott Bird. As was the carrot cake. From left, Jo Thigpen, Angie Wilson and Lori Fuller. Joan and Victor Ashe with Lin Christenberry, right. Dorothy Stair, left, and Betsey Bush. From left, Laura and Mark Heinz, David and Tracy Dewhirst, Evelyn Gill, Ashley Capps and Birgitta Clark. Rich and Jane Ray with Noel Hudson, center. From left, Emma Gross, Martha Ashe and Claire Herrin. Victor Ashe, standing, with Wanda Moody and Vic Sheldon, who with his wife, Jewell, drove to Knoxville from W. Lafayette, Indiana, because they wanted to support the botanical garden. Emcee for the evening was longtime Knoxville disc jockey Jeff Jarnigan. 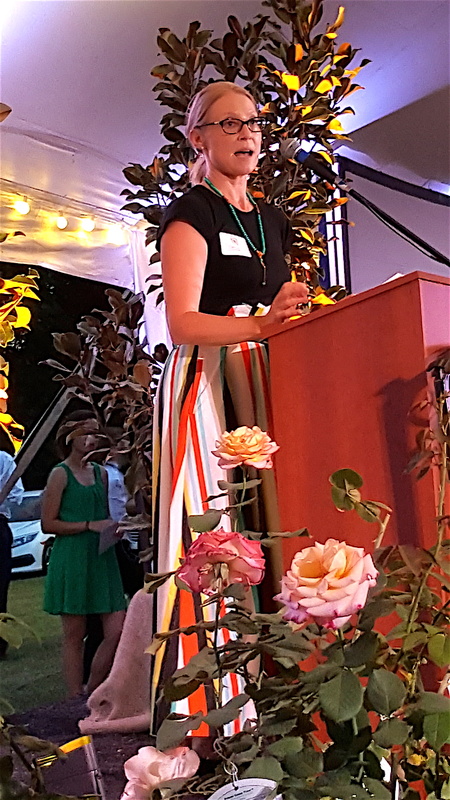 Sara Hedstrom Pinnell, who designed the new garden, made a few remarks. From left, David Gilbert, Jim Hickok, Jim Samples, Cynthia Gibson, Lori Hickok and Margaret Samples. Jim Samples, Cynthia and Lori are executives at Scripps Networks Interactive. Auctioneer Bear Stephenson, left, and state Sen. Becky Massey and her husband, Morton, got special thanks for their services. The Masseys handle check out and payment for area nonprofits. Stephenson raised the money. It was a sweet evening. I can’t wait to watch the new garden grow. All right l have to say it. Isn’t Presley the loveliest young lady. We are so proud of that little girl. Thank you Cyn for including her in the blog. Maria: I agree. It was a special evening in many ways. Dawn: She is almost grown, isn’t she? I’m just glad she was there. I needed a young person in this one! A beautiful tribute for a special person. Kay: It was brilliant to create that garden in Andie’s memory. I can’t think of anything more fitting. As a close friend of Andie Ray’s, I must say how much I missed being there this year. Your beautiful pictures of Andie’s Secret Garden make me teary. Thank you so much for bringing me to the party with your blog!! Such a special place! Allyn: We can visit it next Friday when you and I will both be at the botanical garden. I am very interested in watching how it gets established and changes with the seasons. I think Andie would adore it. Cynthia, loved seeing all the pictures! It doesn’t look “hot” on paper. It was a great evening, tribute to Andie, and opening of KBGA’s new Secret Garden. Love Martha’s picture, the girls had a great visit to TYS….. If we are lucky I may get Martha to move home someday! Joan: I hope you do get Martha to move back here! She was one of the best interns Moxley Carmichael has ever had. And, yes, they were adorable. I hated to miss this event this year. Can’t wait to visit the Secret Garden. It looks lovely. You covered this beautifully! One important thing to note about the garden is that is fully accessible as one of the main characters in the book is wheel chair bound before being healed through being in the garden. The boulder sitting room is arranged to accommodate wheelchairs without looking like it! Sara: Thanks for pointing that out. That is wonderful. Makes it even more special.